I may be a little late to the party on this one, but our family recently discovered baked kale chips. As far as snacks go, you could do a lot worse, despite the inevitability of some of kale’s nutrients being lost during the baking process. In fact, I’d be curious to know just how much of its nutrition is lost after 12 minutes in a 350 degree oven. Some sources say dehydrating it preserves more nutrients, but we haven’t advanced to that. Maybe now’s the time to try the built in dehydrator that my oven has on it. 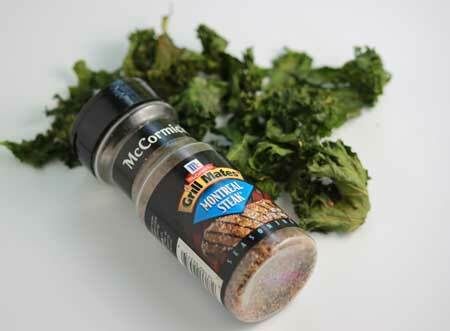 For now, my new way of making baked kale chips is with Montreal Steak Seasoning from McCormick. We also like it with just olive oil and a bit of salt. Baked Kale Chips are made with fresh kale and olive oil. Preheat oven to 350 degrees F. Pour your olive oil onto a large, rimmed non-stick baking sheet and spread it around a little. Wash and dry the kale, then cut it away from the stems. Break up the leaves to make small (anywhere from 1 to 2 inches) chip size pieces. Put the dry kale on the baking sheet with the oil and kind of swirl it around in the oil to get a light coat. Salt it or add your favorite seasoning. Bake the Kale on the center rack for 12 to 15 minutes (checking at 10). If you haven’t tried it, here’s how to make it.